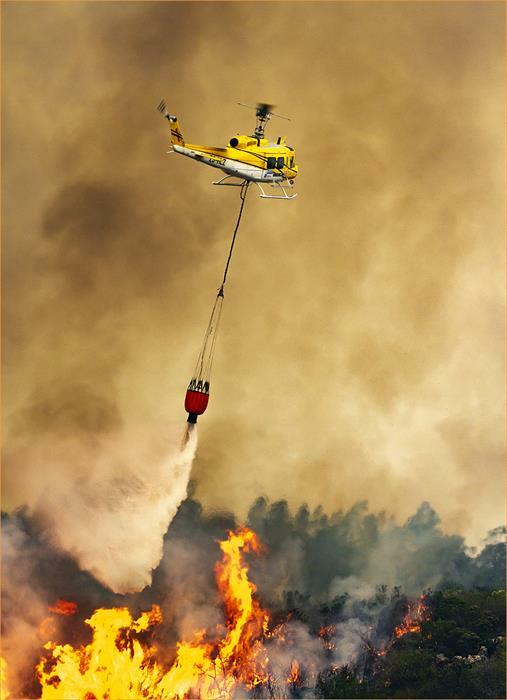 Nico Heyns of Working on Fire was the pilot in this helicopter when this photograph was taken by Danie Pretorius. Nico died only months later while again piloting a helicopter and fighting a fire. MOSSEL BAY NEWS - The winning image of the year for 2018 at the Rauch Gertenbach Photo Gallery is on display. It was taken by Mossel Bay photographer Danie Pretorius. It is a photograph of a helicopter dropping water on a fire in Ruiterbos at Friemersheim. A spokesperson for the photo gallery says Danie recalls that on 30 April 2017 a call was made to contribute water and food to firefighters working on a raging fire in the area. Being passionate about helicopters, he knew that some firefighting aircraft would be in action and he set off with camera gear to a dam on a private farm, where he heard water would be collected to douse the fire. This led him to follow the helicopter trail on foot for about one hour, hiking through dense bush and encountering several fences and thorn bushes on the edge of the fire which was raging in a kloof. Danie describes the heat as close to unbearable, with a brisk wind urging it on, the gallery spokesperson says. In addition to the heat, he had the spray of the water blowing his way and protecting his gear against both heat and water became a constant challenge. Moving up against the edge of a kloof, virtually the same height as the helicopters used by Working on Fire pilots, Danie started shooting for about 30 minutes before he was forced to leave because of the dangerous and extreme conditions. His determination paid off and several shots of an American-made Huey chopper were captured, among others. Little did he know then, that the pilot of the Huey, with licence Zulu ZS-HLZ, was Working on Fire's Nico Heyns, who tragically died at age 65, a few months later, fighting another fire 40 kilometres outside Riversdale. Danie was more than pleased to share more images captured on the day. A personal friend of Nico, Kobus Crous, brought Danie and Nico's family in contact with each other. Danie was more than pleased to share more images captured on the day. All of these images have become a precious treasure to the widow of Nico Heyns. They show him doing what he knew and loved most: flying and fighting fires, the photo gallery's spokesperson says. This remarkable photograph, along with other excellent images, is on exhibition at the Rauch Gertenbach Photo Gallery at 10 Church Street, central Mossel Bay. Photographers meet monthly at the gallery.